Online Relationship? That sounds fishy. In the Fall of 2010, a man named Ariel Schulman released an independent documentary he made following the tale of his brother, Yaniv Schulman (Nev for short) on his quest to meet the “love of his life”, whom he had only spoken to online. Sounds cute right? How about when this love of his life ended up being a completely different person, hidden behind a fake picture? 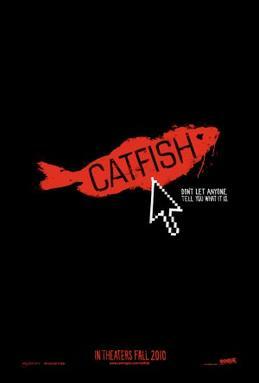 The movie was called “Catfish” and since its release, it’s started a worldwide phenomenon. People everywhere decided to contact Nev to see if he could help them meet THEIR online flames. And thus, the wildly popular MTV series ‘Catfish: The TV Show’ began. ‘Catfish’ (also known as ‘catfishing’) is now a term that means to engage in an online relationship with a fake name, personality, and photo, for the sole purpose of deceiving someone. This leads me to address a huge issue with the anonymity of the internet: How do you know someone is who they say they are? Hiding behind the computer, you can pretend to be anyone you want. This gives people endless opportunities for deceit and revenge. What better revenge than making someone fall in love with someone who isn’t real, forcing them to become vulnerable and to open up to a fake person? Such great karma, am I right? Now, not all cases on the show Catfish are of deceit. Some are genuine people who have genuinely fallen in love with each other. However, this is not common. One particularly interesting episode, one young woman was being catfished by another young woman who simply wanted the first woman to stop flirting with her boyfriend. Is that really worth the two years of time and energy she put forth to make this fake person seem real? Now what can we learn from this, people of the internet? First, you don’t know who anyone is online. For all you know, I could be Fidel Castro instead of a mild-mannered college student. There are certain warning signs you need to look out for when engaging in online relationships so you know if you’re a victim of catfishing. Luckily, this article from the Boston Better Business Bureau breaks them down for us. In general, be cautious if the person you’re talking about seems absolutely perfect. If it sounds too good to be true, it probably is. If they claim they love you but refuse to talk to you on the phone, get out of there. That’s some true shade. If you try to meet them but things keep “coming up” that prevent them from meeting you at the last minute, honey you probably have yourself a catfish. If they have very few friends on their social networking site of choice, they’re probably not real. Look, the internet makes it so easy for people to become anonymous or pretend to be someone else. It happens every day. It could even happen to you, if you’re not careful. Be mindful of who you’re talking to on the internet because they could be anyone. Don’t fall victim to a catfish.